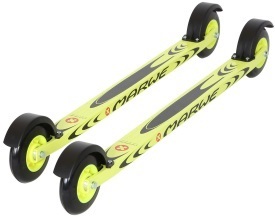 For 2018, Marwe have updated the graphics on their excellent aluminium range of rolleskis. These skis have robust metal frames and share the same wheels as their 'composite' counterparts, the 620XC, 700XC and 590XC. The Marwe 610 A skating roller ski is the favourite of many clubs and skating roller ski beginners, thanks to their hard wearing wheels and good value. They are also the favoured ski of the leading 'matched' skating roller ski races, and few manufacturers can equal the quality of Marwe's wheels and bearings. Supplied as standard with Medium US6 wheels - Fast US0 and Slow US8 wheels are available. The Marwe 700 A classic roller ski is also regarded as one of the best classic roller skis for beginners. As with the 610A's, the metal frame is slightly more stable than the composite roller skis, and the 700A has quite flat 'barrel' shaped wheels which further add to their stability. Supplied as standard with Medium 6C6 wheels, with faster and slower wheels available. 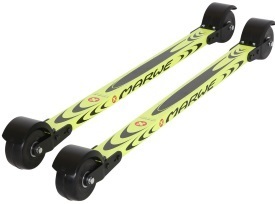 We supply the Marwe 590 A roller skis as 'combi' skis, which means you can practise both classic and skating technique. They are probably the most popular roller ski we sell to beginners. They are great value, have excellent quality wheels and bearings, and give the possibility of doing both techniques. They will always be good for classic technique, and as you improve your skating technique you can move onto thinner wheeled skating roller skis (such as the 610A), for a better feel of skate skiing on snow.